So, I was in the HobLob a couple of weeks ago looking for Fall signs to add to my wreaths. Well of course I found a lot more than signs! I found pumpkins of all kinds; Styrofoam, wood, fabric, you name it. I also found scarecrows, fall picks, garlands, ornaments and flowers! But before we get to my Hobby Lobby Fall Haul video and all the fun I had, can I just say how much I LOVE, LOVE, LOVE Hobby Lobby!! They always have some of the BEST stuff for wreaths! I also LOVE how I can find Christian items for my wreaths, which are hard to find sometimes. 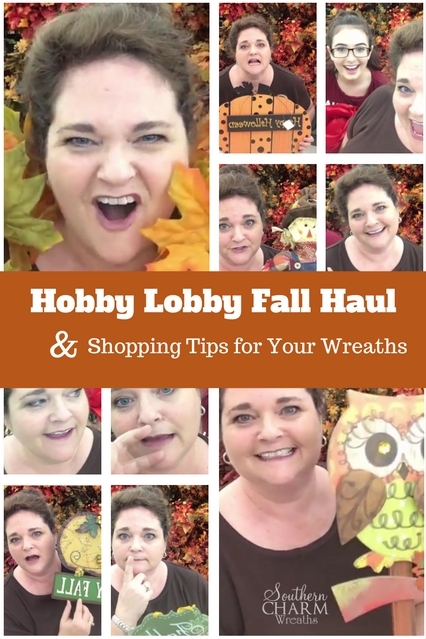 And while shopping in the store with Miss K, my beautiful daughter, I decided I would do a Facebook Live video on my Fall haul and give you tips on purchasing as well as how to secure them to your wreaths. Scroll to the bottom of the post to watch the video replay. Below are a few of my shopping tips when it comes to signs and other items you might find at Hobby Lobby. Before buying a sign or item, make sure you know exactly how you will attach it to the wreath. You don’t want to get back home or to the wreath shop and then not be able to wire it on. Or even worse, realizing that the dang thang is too heavy! That is a bummer. Don’t be afraid to cut off the metal hangers on signs and use your own by either drilling a hole or use existing holes. Always wire signs into wreaths, never just glue. It’s best if you can do both, hot glue and wire but sometimes, like with metal, wiring is enough. Wire in more than one place too, typically 3-4 places. Make sure your sign will hold up in the elements. You don’t want to use a sign that will be yucky after a rain fall. You can get ideas from items in the stores or cool color combos. For example, in the video I show you a sign that uses turquoise for Fall and it’s adorbs!! Instead of purchasing individual flower stems, consider purchasing garlands of flowers and leaves that can be divided in order to save money. Use small signs or ornaments to hang in lantern swags. Make sure to hot glue any dangling items on signs so that they don’t jiggle around when the door gets slammed, like when your teenager gets that attitude! Mamas, you know what I mean! Comment below and let me know if you enjoyed watching me shop! Hey, if you want to catch me Live on Facebook next time, make sure to follow me there and then subscribe to my Page by following these directions. This is a great video. Very helpful! And I saw several I had already purchased. Yay! Glad you liked it Mary-Pat! I live in Mesquite Texas! I found myself answering you when you asked could we hear you! Lol! Y’all looked like y’all were having lots of fun!! This was so much fun!!! Thanks for detailing how to attach items. Sometimes that’s the hardest part for me!! Loved your video. You had really great ideas and tips! You looked like you were having so much fun and it made me laugh. Thank you for sharing your fun and ideas with us. Loved your HobLob video! Will be making some lantern swags after seeing yours HobLob, here I come! Absolutely loved this video Julie! I will have to run over to my Hobby Lobby to get a few of the items you shared. The picks to use with lanterns, that leaf garland and that super cute big pumpkin sign with the Happy Halloween metal hanging sign. I plan on really making my front porch look festive this fall! Thank you for great video. I buy from Hobby Lobby all the time. I am just starting my wreath business. Great video Julie! Miss K is so pretty. Would love to see more of these. Thank you – this was a great video and it inspired me to make a hobby lobby trip to make some lantern swags! I learned so much about how to turn items that I would never have thought of to use in a wreath into amazing decorations! Loved the video you are so cute and fun! Glad you liked it Mindy! Oh my gosh, I love this video!!! I called my husband into my “genius room” (a.k.a, craft room) and he was watching you, also. He laughed, thought it was great!!! Thanks for sharing these ideas with us because there are times when I’m challenged on how to attach some of the signs, especially the garden stake signs, so I haven’t bought any. You are a such a blessing for helping all of us!!! OMG that is too funny, your hubs was watching. LOVE it! Thanks for sharing and commenting Laurie. Colorado here. Enjoy your videos and blogs. Although I am not in business, Seems like I always have gifts to make for someone. Great ideas-and people seem to appreciate them. Enjoyed the “Holly Hobbie” (as we call it here) preview. I’ve been shopping in the Michael’s and Joann’s clearances the last few weeks. Preparing for next spring. Need to make a HOLO trip. That was a great idea doing a video from there. A lot of great ideas and tips on hanging signs. You should do more of these which makes it more interesting and gives it more of a idea on how to do things and choosing items for the wreaths. thanks for the info and great video!! I so admire you & your creativity & Talent. I can’t begin to tell you how many things I have learned from you! I will be buying your videos in the middle of September, I love Hobby Lobby but you have really inspired me to make a trip to our Hobby Lobby in Medina Ohio. for the Autumn & Xmas Seasons. Thank you so much for sharing with all of us! I love making wreaths but you are the best I have ever seen in the creative world! I am in awe of you & your beautiful finished products! Thanks again for inspiring me to bring out some creativity too. I am a true fan! PS your daughter is beautiful! Loved this video. It’s always great to learn the mechanics of attaching items to a wreath. Loved what you showed from Hobby Lobby. We have just gotten a Hobby Lobby in Raleigh, NC. I did not get to watch you live but I really enjoyed your “Hobby Lobby” video. I do hope you post more of these videos full of ideas of things we can use to make and decorate wreaths. Thank you. I absolutely loved your video! Please do more of these! Always wanted to make wreaths but they just weren’t right somehow. Thanks for sharing your creativity. This was so much fun! I think HL should thank you for being in their store. I hope you do more “Road Trips”. I don’t sell, but would love to see places where you shop or buy whole sale or unique stores or even interviews with other designers or wreath makers. Always let that personality of yours shine through, you always make me smile. Blessings.